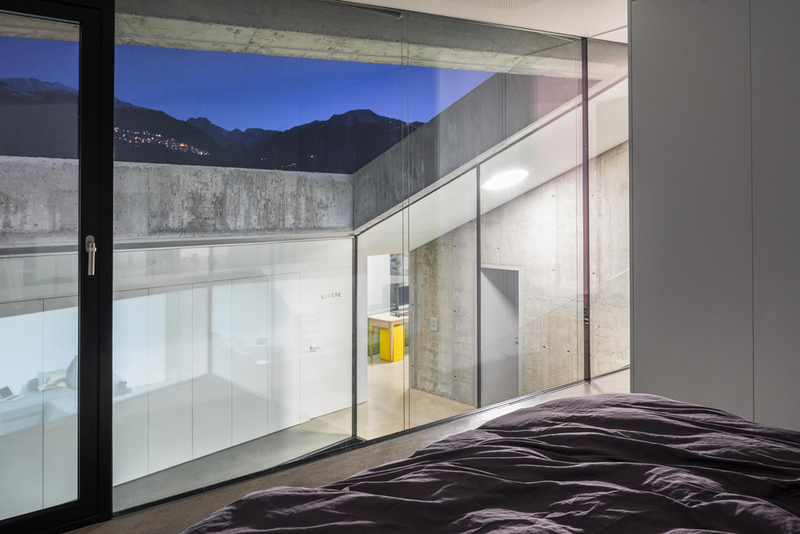 This robust concrete house in the Swiss town of Savièse steps down the side of a hill and contains rooms lining internal patios that look out towards the nearby mountains. Local studio Anako Architecture designed the property for a gently sloping plot that is overlooked by neighbouring detached houses. The proximity of the surrounding homes prompted the architects to design a building with solid concrete walls that minimise views of the interior from outside. “Blind walls of raw concrete border the site and define the facade of the house which, like a fortress, protects itself from any opening to or direct relation with the neighbouring properties,” said Anako Architecture. “The project complies with its commitment to integration by recognising and respecting the scale of the site,” the studio added. “It rejects, however, any mimicry with neighbouring buildings.” The gentle incline of the site prompted the division of the building into three stepped half levels that accommodate the entry, the daytime living spaces and the bedrooms. This composition is intended to take advantage of the south-facing aspect, and helps to ensure each level has views along the Rhone river or towards the Alpine mountains. The entrance is accommodated beneath a cantilevered canopy that unfolds from a corner at the highest point of the building. Once inside, the living spaces extend down the slope and are arranged around three open-air patios. The outdoor areas are lined with glass to ensure natural light floods into the surrounding rooms. 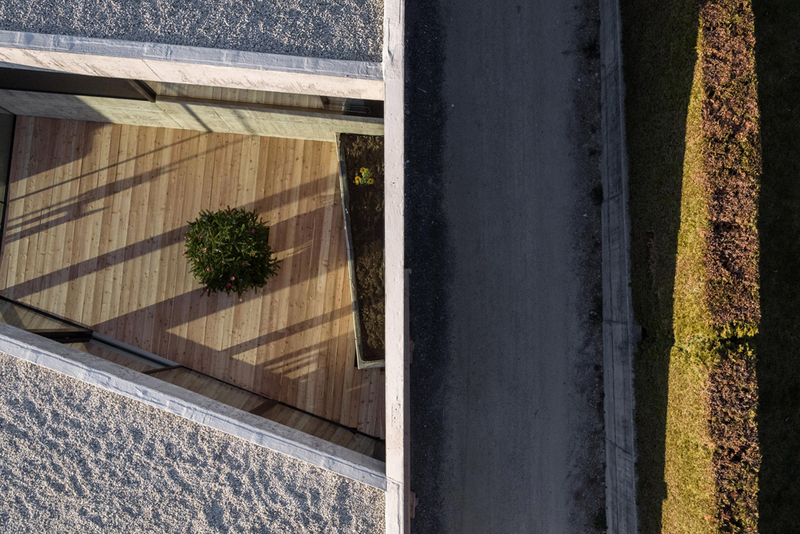 The transparency of the glazed surfaces contrasts with the house’s heavy concrete exterior and provides a visual connection between the internals spaces. Alongside the entrance on the uppermost level is a master bedroom flanked by full-height windows that overlook the first of the patios. A pair of bathrooms and a study are accommodated on the next level, with a final set of steps descending to the main living area. This space containing the kitchen, dining area and lounge wraps around a decked patio. An additional deck on the other side of the room provides continuity between the internal and external spaces. Around the tops of each glazed garden patio, the thickness of the concrete roof creates a strong frame for the views of the mountains and sky. The external concrete surfaces were cast using rough formwork that provided a textured finish to contrast with the pristine white walls of the interior. “Concrete is structure, material, space, shadow and light,” said the architects. 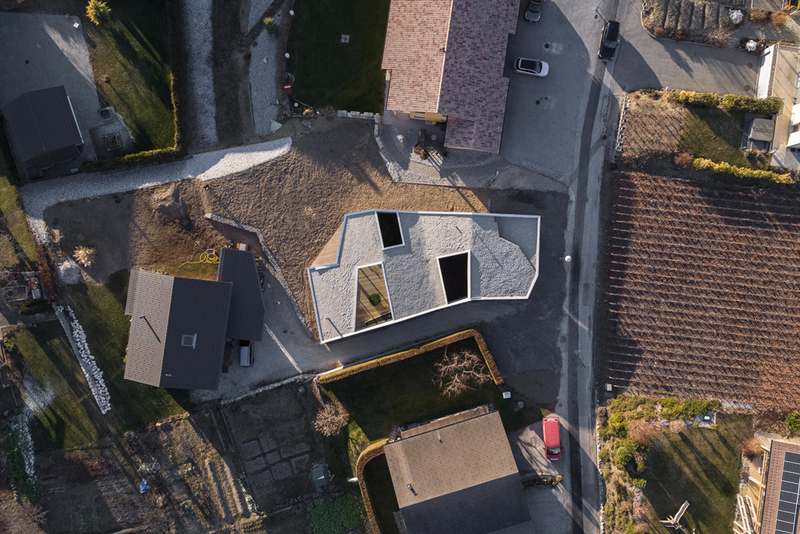 “It materialises the radicalness of the architectural concept.” The tactile quality of the concrete shell is complemented by a layer of gravel covering the stepped roof that lends it an uneven, natural appearance.